Here at the Gatton Academy, our counseling services are individually catered to each and every student, no matter their need. 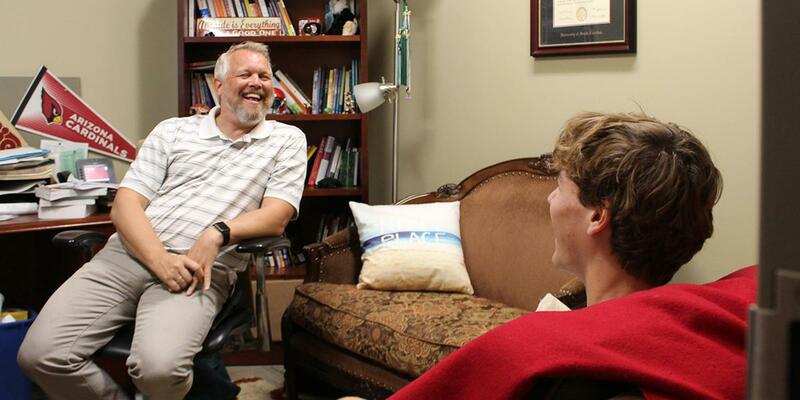 From personal counseling sessions to college counseling as well as general academic advising, counseling services are available to each student while enrolled here at the Gatton Academy. Our strong emphasis on the student as a holistic individual has allowed for students to excel in all aspects of their personal, academic and future professional selves. The aim of the counseling services staff has always been and will always be about the student. We believe that each student has the capacity to blossom into the best versions of themselves while here at the Academy and this is achieved through close partnership of staff and students. While all staff at the Academy work closely with one another, the Counseling Services staff works hand in hand, for example, to create academic success plans for students, create a college application schedule or even locate services on campus that a student may need to better succeed in the classroom. Because all staff are located within Florence Schneider Hall, students are able to have easy access to all aforementioned services. Having a tough time completing your homework? Unsure of where to apply to college? Experiencing a sudden drop in motivation? Learn more about all Counseling Services offered while attending the Gatton Academy in the links on the right hand-side of this page. Individual counseling sessions as well as various group-based experiential counseling sessions are available to all students during their time here at the Academy. Click here to find out more information about the services offered by our two in-house Licensed Professional Counselors. College counseling services are provided by The Gatton Academy's Coordinator of College Counseling Tracy Harkins. Click here to learn more about the services provided to the students who attend The Gatton Academy.